The license for the Swedish Landsverk L-60 was bought in 1938, to be produced by the MÁVAG and Ganz factories. On paper, the new model’s armor was only slightly decreased, in order to allow a greater supply of ammunition and better agility. 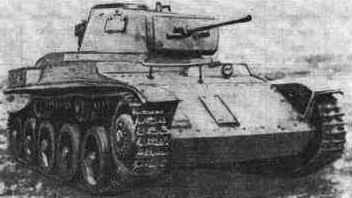 On 17 August 1937, the V-4 was tested with all-Hungarian armament. At that time, the Hungarian army’s main potential enemy was Czechoslovakia, and only relatively light tanks were required to cope with the Czech models. The Swedish Landsverk tests done in Hungary had also led to a redesign of the turret ergonomics and enhancement of the shock absorbers. The turret was originally planed to carry a 25 mm (0.98 in) Bofors gun, but the project had to be dropped when faced with pre-production and supply problems. Thus, the well-proven Type 36M 20 mm (0.79 in) infantry gun was chosen instead. It was more compact and already available in large quantity. The gun’s magazine did not fit in the turret either, so a new one had to be designed. An additional issue concerned the Gebauer machine gun belt, that was redesigned, and temporarily the older M 34/37 machine guns models had to be incorporated. This model also had to be adapted, since the storage location did not fit in the allocated space. The turret electric engine was also always on, because it had a tendency to turn itself off. Considerable attention was paid to speed and agility, with the goal of having an 8 m turning radius. This was allowed by a revised five-speed gearbox and advanced steering. Each cranked axle control arm consisted of double running wheels connected to a common hub. The first and fourth swing arms were fitted with spring shock absorbers. The return rollers pulled the tracks up, and they each had a separate cranked swing arm. Miklós Toldi was a famous Magyar medieval knight hero (+1390), and a prominent figure in Hungarian history, and the tank was named in his honor. By May 1938, 38MR/5 radios were chosen and designed to equip the first operational tanks. These models, depending on the terrain, could reach a range of 6 to 30 km (4-19 mi). In February 1939, the final production order came. The first two were delivered on the 13th of April 1940, and were examined and approved by a military commission. Another 20 followed until June, 10, and, at the end of June, a further 20 units were built by MÁVAG (80 in all). However, the torsion springs and the optical equipment were in short supply, due to slow production. By March 1941, the army ordered another series. During this time, nearly two hundred Toldis were built. The most common defects were the spring and torsion bar poor quality casting, which resulted in many cracks and the tendency to fracture easily in operations. German assistance guaranteed a constant supply of spare parts, mostly mechanical parts (bearings, drive shafts, etc), and optical equipment. Others were purchased from Switzerland, allowing a steady production from 1941 to 1942. During the early phase of World War Two, in Yugoslavia and during the early phase of the summer campaign against the Soviet Union, the Toldi showed excellent qualities. But, later on, fundamental shortcomings quickly appeared, notably when facing the T-34 and KV-1 tanks. The 20 mm (0.79 in) gun proved inadequate and totally ineffective against their armor. 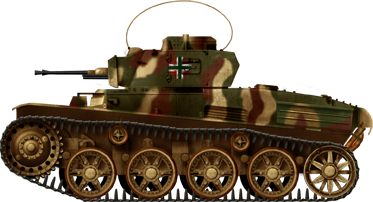 From 1942 onward, despite the arrival of the Toldi II, the Hungarian infantry still had to fight against a growing number of such Soviet tanks with the same increasingly ineffective anti-tank weapons, which led to proposals of conversions and tactical shifting. The Toldi II only received increased frontal armor, up to 30 mm (1.18 in), but was nearly identical in many aspects. In all, 110 were made. Later on, the Toldi IIa introduced a licence built 37M 40 mm (1.57 in) anti-tank gun, highly accurate and with good muzzle velocity. This considerably increased their antitank capabilities. The tanks were further modernized in 1942, but the expected full upgrade never took place, and what was done consisted in replacing the 37M with the 42M main gun. From beginning of 1942 until April 1943, 80 Toldi IIs were upgraded to the Toldi IIa standard. A logical step forward was the next generation Toldi III, with thicker armor (40 mm/1.57 in glacis and mantlet) and the introduction of spaced armor. However, due to the deteriorating industrial conditions and Allied bombings, production came to a standstill and only 12 of the new 43Ms were delivered. The inability to up-gun the Toldi, dictated by the cramped turret, led to some plans inspired by German practices. Most notably was the conversion to a turretless tank hunter, which would be capable of operating a far more powerful gun. This attempt, in 1943, led to the development of the Toldi páncélvadász, a Toldi rearmed with a German 7.5 cm (2.95 in) PaK 40 L/48. But this project, due the lack of time and resources, never materialized. Compared to the original design, the Toldi was faster, more agile and nimbler, with good off-road performances and a powerful and reliable radio set. They were used as frontline tanks, in light armored brigades or fast motorized ones. Some Toldi Is participated in the Yugoslavian campaign of April 1941, seizing the Bánát province of Bácska, thus adding this new territory to the Kingdom, but the tanks were not seriously tested. However, in the summer of 1941, all the might of the Carpathian Army Group was committed to Operation Barbarossa. It was engaged in harsh frontier battles, most Toldi tanks being part of the Mobile Corps (1st Motorized, 2nd Motorized and 1st Cavalry Brigades). Their main opponents were the T-26 and BT tanks, lightly armored, but equipped with 37 mm (1.46 in) guns. They fought at Nikolayev, south of Kharkov, together with the German 16th Panzer Division and SS-Leibstandarte Brigade. By early 1942, a considerable force was gathered, including the III Corps, IV Corps and VII Corps, composed of various light divisions, all equipped with armored cars and Toldis I and II, along with the 1st Armored Field Division. More frequent encounters with T-34 tanks led to the Toldi IIa. But the increase in armament did not compensate for the lack of protection, and, during the upcoming battles, from Voronezh to the Don, many more were lost. 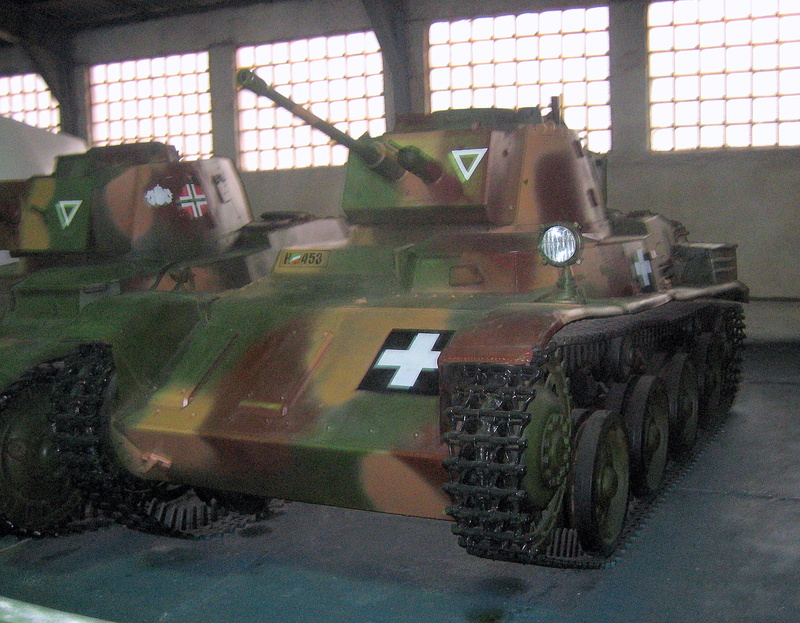 By that time, from mid-1942, most surviving Toldi tanks were used exclusively for reconnaissance. They fought at Uryv and Karotyak, and light units were resupplied with Škoda-built Panzer 38(t)s. Unfortunately, the latter were even less prepared for the bitter cold of the winter 1942-43. Moreover, after the storming Soviet counter-offensive of January 1943, the Hungarian forces, exhausted and short on ammo, took crippling losses and were evacuated to the rear, as well as the remaining Toldis. They would see no more action until mid to late 1944. The only surviving vehicles were captured by the Soviets, and now displayed at the Kubinka museum. 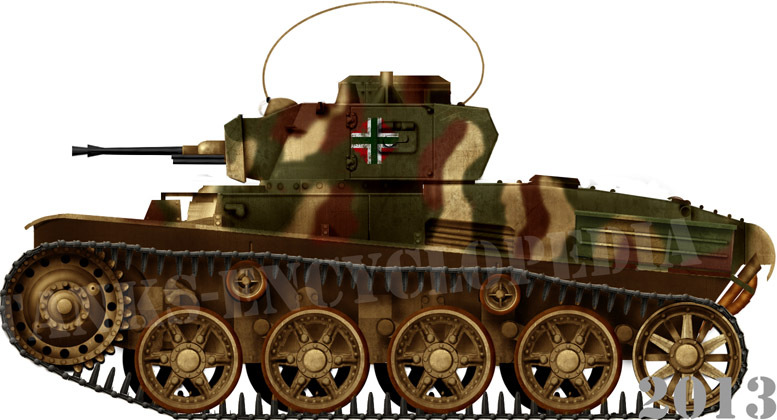 Hungarian light tank 38M (A20) Toldi I. Notice the early Hungarian cross. The usual three tone pattern was applied over the factory sand beige. Late Toldi I of the 2nd Armored Division in Poland, summer 1944. Toldi II (B20) in Ukraine, summer 1942. 80 of these were later rearmed with a new 40 mm (1.57 in) gun. Toldi IIa (B40), Stalingrad sector, winter 1943-44. Toldi IIa (late production version). Western Ukraine, summer 1943. Toldi III 43M (C40). Notice the protective side skirts and turret spaced armor (Schürzen). Only 12 were delivered. The olive green paint was factory-applied. 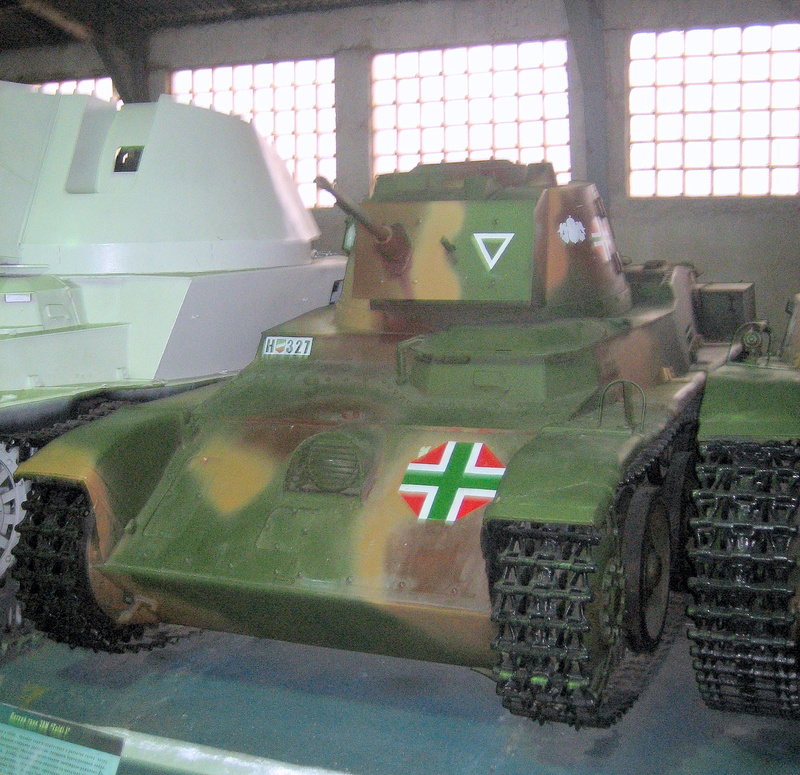 Hungarian 38M Toldi I light tank at the Kubinka tank museum. Rare photo a Toldi I, presumably on the Eastern Front. Their main opponents were the T-26 and BT tanks, lightly armored, but equipped with 37 mm (1.46 in) guns. Mistake – should be 45 mm (only some hunderts of T-26 and BT-2 were equipped with 37 mm guns).